Even in this day and age, we don’t have enough stories on stage about ambitious women actively seeking out the life they want, regardless of the obstacles in their way. For three years, a small group of playwrights worked with TimeLine Literary Manager Ben Thiem in a series of meetings, workshops and readings to develop a new play from start to finish. We asked each playwright in the 2013-2016 inaugural Playwrights Collective to talk a little bit about their play and their process, to be featured on Behind the ‘Line. Today we welcome you into playwright Emily Dendinger‘s world. In 1897, Adelaide Herrmann, widow of famed magician Alexander Herrmann, successfully performed the most dangerous feat of magic: the Bullet Catch. Vivacious, independent and brassy, Adelaide Herrmann started her career on the stage by sneaking off to take ballet classes as a child, depending on her sister to keep her secret from their mother. Ultimately, Adelaide left home to perform as part of a traveling bicycling troop. She met Alexander for the first time while they were performing at the same theatre, but it wasn’t until their second meeting aboard a ship to New York City that their whirlwind romance began. By the end of the two-week voyage, they decided to marry—even though Adelaide was already engaged to someone else. Adelaide soon quit her troop in favor of being Alexander’s assistant. Together, they developed some of the most well-known illusions of the time. Their union launched a long and prosperous career that made Alexander a household name, until his sudden death of a heart attack in 1896. Faced with mounting debt and bills, Adelaide summoned Alexander’s nephew Leon, an aspiring magician himself, from Europe to take over her husband’s show. While Leon was a competent magician, he lacked the craft and showmanship of his uncle. Adelaide soon decided a replacement was necessary and decided there was only one viable option: herself. 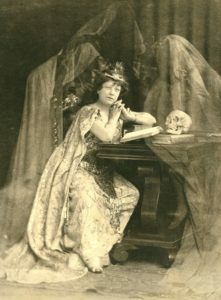 Prior to Adelaide, female roles in magic were limited to assistants and spiritual acts, or small parlor shows. 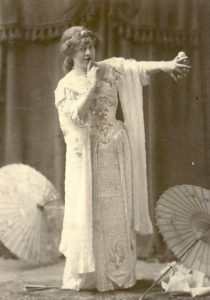 The idea of a woman magician had never been considered before, and not all parties were in favor of Adelaide’s decision. However, skeptics were quickly proven wrong when Adelaide successfully performed the dangerous Bullet Catch on the steps of the New York City Library with the New York militia. 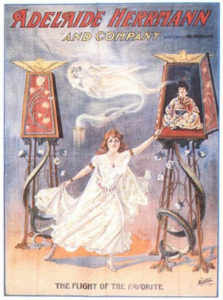 Following this illusion, Adelaide earned herself the name Queen of Magic and went on to have a long and successful career in her own right, even serving as mentor to a young magician named Erik Weisz. When I first heard about Adelaide Herrmann, I was immediately intrigued—here was a strong, capable woman clawing her way in a man’s profession. Sound familiar? After reading her autobiography, I was delighted by Adelaide. She was witty, charming and astute—a born storyteller. But even more than that, underneath seethed an intelligent, passionate woman who desperately wanted something and would stop at nothing to get her way. Even in this day and age, we don’t have enough stories on stage about ambitious woman actively seeking out the life they want, regardless of the obstacles in their way. Hence, the seeds of The Grand Illusion Show were sowed.